Police found Grayson's body while making a wellness check, WITN reports; Tyrrell County Sheriff Darryl Liverman told the Outer Banks Voice she may have been dead "as long as two or more weeks." 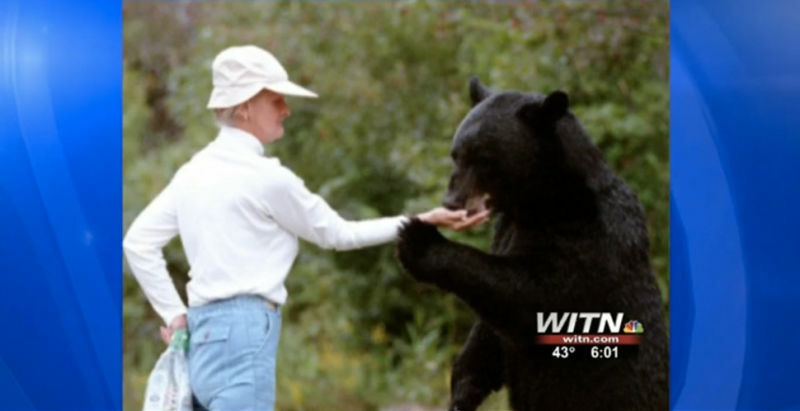 Across 20 years, the wildlife enthusiast had grown renowned in the community for feeding the bears that lived in the woods surrounding her home. According to the Outer Banks Voice, she would "call to the bears in sing-song, prompting the animals to emerge from the shadows as she poured piles of dog food for them. Some of her favorite bears would even eat out of her hand." "She was definitely very cautious with them and understood their power and respected them," Sgt. Mark Cagle of the North Carolina Wildlife Resources Commission told the paper. Over the years, Grayson would make call after call to the local sheriff's office to report shots fired, fearing for the bears' safety from hunters. Grayson reportedly left behind her life of "high living and working as professional dancer," as well as many modern conveniences, to live simply and among the expanse of woods and its creatures that blanket her land. Since the early 1990s, Grayson lived by choice in a modest trailer on what was originally about 1,000 acres of land off U.S. 64 on the edge of the tiny community of Alligator. Until recent years, when she acquired a pay-as-you go cell phone, she did not have a phone, but made her calls from pay phones or borrowed phones. She had no running water, no electricity and no air conditioning. She relied on a kerosene heater when it got cold, and used an outside toilet. When she needed money, she would sell a piece of land. If she needed to go to Columbia or Manteo, she would walk to the end of her long driveway and a wait on the edge of U.S. 64 for a friend to pick her up. "She was different," Cagle told the Outer Banks Voice. "A lot of people say she was a fanatic. I would say that was true to some extent—but she wasn't crazy. She was more passionate about the bears than fanatical."